Byzantine Ottoman Relics Tour Visit the top historical attractions of Istanbul with our one day walking tour. Explore UNESCO-listed Hagia Sophia Museum, the Blue Mosque, Topkapi Palace, Istanbul Hippodrome. We will pick you up from your hotel after your breakfast for the walking tour in old city. This tour covers the most famous historic monuments and sights in Old City area. These are 1500 year old Hagia Sophia Museum, gigantic Blue Mosque with its famous blue tiles, Hippodrome area where the Byzantium era chariot races used to be once held, Topkapi Palace and world’s oldest indoor market, Grand Bazaar. After the tour, we will take you back to your hotel. 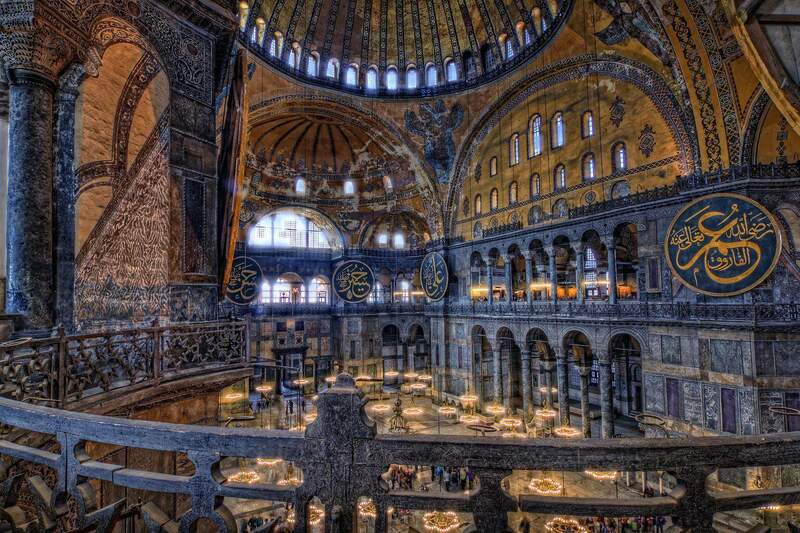 Hagia Sophia (Aya Sofya) is a UNESCO-listed museum that contains Ottoman and Byzantine works. From golden age of Byzantine, this once Christian church is one of the most extraordinary buildings in the history of architecture. Listen the history and examine the architecture displays with your professional guide. Next stop is Topkapi Palace , the largest and oldest palace in the world to survive to our day and also was the primary residence of the Ottoman sultans for approximately 400years. Topkapi Palace was more than just the private residence of the Sultan and his court. It was centre of the supreme executive and judiciary council, the Divan and the training school. The best artist and craftsman’s produced some of the finest work in the whole empire. Then, make a visit to the Blue Mosque with six minarets, was built at the bequest of Sultan Ahmet I and one of the best preserved and most significant examples of Ottoman architecture. Continue to Istanbul Hippodrome where chariot races were held and also the centre of Byzantium’s life for 1000 years and of Ottoman life for another 400 years and has been the scene of countless political dramas. Stop by Caferaga Medresesi, of foundation for serving Turkish Culture, also organises various workshop about handicrafts and music. Then give a little break for lunch in a local restaurant with typical Turkish cuisine. The next stop is the Grand Bazaar, one of the most famous bazaar around the world. Discover the bazaar with your guide and make some shopping. It is full with jewellery, leather and spices shops. Topkapi Palace is closed on Tuesdays; should you travel on this day, you’ll visit the Basilica Cistern instead. The Grand Bazaar is closed on Sundays ; should you travel on these days, you’ll spend additional time at Arasta Bazaar.